Director – Richard Schenkman, Screenplay – Emerson Bixby & Richard Schenkman, Story/Producers – Richard Schenkman & Eric D. Wilkinson, Photography – Richard Vialet, Music – Mark Hinton Stewart, Visual Effects – Joseph J. Lawson, Production Design – Sally Courtois. Production Company – MFE II Inc.
John Oldman is now living in Chico, California under the identity John Young where he is working as a comparative religions professor at the local university and has settled into a relationship with fellow professor Carolyn Kitriss. Student Isabel Chang becomes curious after she borrows one of John’s books and finds an inscription to John Oldman. The book is written by Art Jenkins and tells the story of John’s claim to be 14,000 years old. Jenkins was ridiculed and academically discredited for making the claim that this was a true story. Believing that their John might be John Oldman, Isabel and her friends contact Jenkins and try to obtain a photo of John. Jenkins sets out to travel there. However, when one of the group Tara blurts out feelings for John and confesses that they know his secret, he makes immediate plans to leave. In trying to stop him going, they taser him and make him prisoner, determined to find the truth. The Man From Earth (2007) was a modest success, not so much in its original release but gaining a word of mouth afterlife after being pirated on bit torrent. The film was the final screenplay of noted science-fiction author Jerome Bixby. 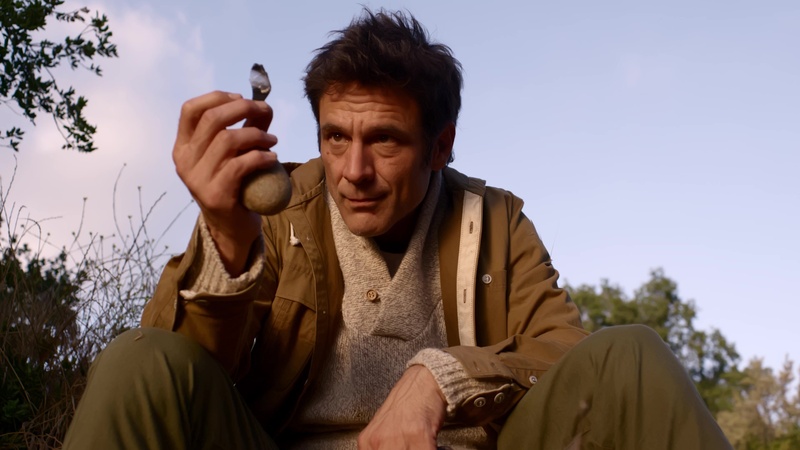 The film’s director Richard Schenkman adapted The Man From Earth into a stage play in 2012. Since then, Schenkman has been attempting to raise funds to make a sequel, including an earlier Kickstarter campaign that failed to reach its target goal. The sequel finally emerges here, featuring return appearances from David Lee Smith as the title character, along with William Katt and John Billingsley. The unique release strategy for The Man From Earth: Holocene is that it was uploaded to The Pirate Bay by the filmmakers themselves. The film comes bookended by an introduction from director Richard Schenkman who asks that viewers go to the film’s website and donate towards the film’s production cost or purchase a dvd copy from them. Schenkman also offers the hope that this funding will allow them to make a sequel (as the mid-credits scene leads the way into) or even a tv series. The disappointment of The Man From Earth: Holocene is that it doesn’t have Jerome Bixby on script. That wasn’t quite the case with the original either – Bixby died in 1998, ten years before the film came out and the film was a script that had been floating around for years. Thus the sequel is written by Richard Schenkman and Bixby’s son Emerson who has had a career as a screenwriter with several minor horror films such as Disturbed (1990), Bikini Island (1991), Last Dance (1992) and On a Dark and Stormy Night (2010), as well as directing the zombie film Dead End (1985) but is not quite in the same league as his father who included episodes of The Twilight Zone (1959-63) and Star Trek (1966-9), as well as the film Fantastic Voyage (1966), among his credits. The Man From Earth was a perfectly self-contained story and does not organically lend itself to a sequel. The original had a simple but ingenious concept – a dinner party conversation where the host reveals that he is 14,000 years old and then the big stinger where he claims that he was Jesus Christ. I mean, what exactly can a sequel do to top a revelation like that? A lot of people liked The Man From Earth based on that twist and it has even been called an inspirational classic. Alas what we have with The Man From Earth: Holocene is a copy made in the belief that that audience for the original will come back for more rather than a natural sequel. Where the first film was about a man telling his unique life story and built up to a kicker of a revelation, The Man From Earth; Holocene is merely about a group of teens who piece together a series of clues to deduce that their professor is the same character from the original (who in the interim has had a book written about him by William Katt). In other words, what we go from is a fascinating after dinner conversation in which a man offers revelations about his very long life to a detective story in which we already know the answer. What sold everybody on the original was the big twist. And what we were wanting to see here was more scenes where David Lee Smith tells stories from his long life, of which we get almost nothing at all, just a series of scenes with the teens debating amongst themselves and Smith trying to avoid detection. (Although what leaves me mystified is how John can manage to fake a new identity every ten years to the extent where he holds a professorial position – something not at all easy to achieve and would require background checks – and a driver’s licence). There is also a plot element introduced where John is seen to have started aging for the first time – perhaps introduced to explain why David Lee Smith looks ten years older than he did in the first film. The point that The Man From Earth: Holocene does start to get interesting is about two-thirds of the way in where David Lee Smith is locked up in a cellar with Sterling Knight who plays a Christian who has read the book and is demanding answers. The scene swings between Knight bowing at Smith’s feet in worshipful awe to turning on him and believing he is the Anti-Christ, as all the while Smith calmly denies any of this is true, leading to the moment where Knight realises that no matter whether Smith is Christ, the Anti-Christ or just a spinner of tall tales, the only logical next step is to stab him. Unfortunately, neither Bixby Jr and Schenkman write as well as Bixby Sr did and the scene often bogs down in screeds of dialogue debating theological minutiae. Elsewhere, Richard Schenkman has made several indie films, including The Pompatus of Love (1995), Went to Coney Island on a Mission from God … Be Back by Five (1998) and And Then Came Love (2007), none of which attained any particular notice, and a few commercial projects such as Angel 4: Undercover (1994) and the action film October 22nd (1998). In genre material, he has also made Abraham Lincoln vs. Zombies (2012) for The Asylum, as well as wrote scripts for other Asylum films with 100° Below 0 (2013) and Zombie Night (2013).